On a Sunday morning I woke up with my eyes in pain, burning. My contacts had gone wrong. In removing them I am pretty sure I scratched the surface of my eye. Come morning, I wasn’t able to keep my eyes open without acute pain and so spent the next few days in blindness. 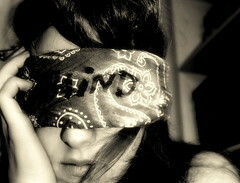 In my blindness, I wasn’t able to do much of anything other than cover my eyes, and sit in the darkness. When I wasn’t fading in and out of sleep – the natural result of keeping my eyes closed for long periods of time – I would listen. At one point I recalled how I spent a day last fall not speaking and how that gave me a different understanding of silence and listening, but I could still see. This time around it seems I involuntarily was fasting from sight. And as I have always heard, within hours my other senses were compensating, more acute. My sense of touch seemed more precise, less dull or routine. My sense of smell started taking on a new depth – a special locator of sorts. And then there is my sense of hearing. A friend would come and go, helping me in the midst of this blindness – bringing food, since I couldn’t see to cook safely anything warm, or simply being company, a voice to listen to in my surprise isolation. Even with this friend I could start to hear things that I couldn’t hear before because my sight had gotten in the way of my listening. I could hear the little nuances underneath a story or even the emotion being expressed visually, but somehow audibly. It is as if I could hear the color behind the words for the first time. Eventually, my eyes healed and I was able to open them. After two days in darkness, though, opening to light was not something that comes fast. Light can be just as painful when darkness is all you’ve known. Painful enough that you might just decide it is better to keep your eyes closed. And even after opening them to the light, once open you have to take it slow in what you look at. I was stir crazy after doing nothing for a few days and was itching to get to the gym. So as the sun was setting, I drove the 2 miles to the rec center, worked out and drove back. Only, it wasn’t as easy as that. It was such an overwhelming experience for my eyes and ears that I hardly made it home, only to crawl back into the darkness and dope up on Tylenol for the headache. Later that evening with friends, I had to ask them if I could turn out the overhead light… so I could see. I’d become accustomed to seeing in the dark. It was easier than seeing in the light. I didn’t necessarily see things clearly, just more comfortably. The truth is… in many areas of my life I often choose to see in the dark, sometimes creating my own conclusions about what it is I am looking at. The conclusions are not what is real, but safer because I created them. I do this easily in friendships, and of course, in the close intimate ones, too, sometimes with disastrous results. And there is no end to how I do this in intimacy with God, choosing to step out of his brilliance and warmth back into the protective darkness and cold. Because sometimes Light is too painful to bear no matter how good the intentions might be. My eyes are fine now. But there are still layers from the experience that will continue to come to light. Even after it all, I still find parts of me a week later, willingly cringing inside from any movement towards light. I know this is not good for my soul, but like I said, it takes much time to get used to the light and the initial pain it causes before you trust it enough to open your eyes up all the way.